I was going to make a part 2 to my season 2 review of the Ben 10 2016 reboot but after giving some thought, I decided to save that for when the remaining season 2 episodes finish airing. I will instead try to go back to making individual episode reviews but instead of doing every episode that airs, I'm just going to review specific episodes that I find to be significant enough to be worth making an episode review for. This is mostly because I want to try and not repeat myself as often as possible and try to focus more on addressing newer points in regards to the Ben 10 reboot show. Any of my past points from my previous reviews that I do repeat are mostly going to happen in my season 2 part 2 review. For this episode review, I'll be covering The Charm Offensive, which is the very episode that debuted the return of Charmcaster. As usual of my reviews, spoiler alert. First off is the plot of the episode...which is a freakin lazy copy of the Ultimate Alien episode, Couples Retreat. I am not kidding with this. Both episodes basically have the same plot. Charmcaster gets into a relationship with Michael Morningstar. Michael Morningstar poorly treats Charmcaster and only views her as an energy source while he still has an obsession towards Gwen. Charmcaster is too blinded by her feelings towards Morningstar to see him as the terrible person that he is. Gwen tries to convince Charmcaster of Michael Morningstar's true nature and eventually succeeds in doing so. Charmcaster uses her magic to overpower Morningstar. These entire plot elements are in The Charm Offensive and Couples Retreat. Christ, even reboot Charmcaster's new name, Heather, came from Couples Retreat. It's the same name that Michael Morningstar incorrectly guessed when Charmcaster asked him what her real name was, which was Hope. That's really what sums up most of this episode. It's another of the many examples of Man of Action and Cartoon Network Studios lazily copying elements and plots from the previous shows into the Ben 10 reboot. The second worse part of this episode is most certainly Charmcaster herself because much like with almost every other returning character in the reboot, she is basically a shell of what she used to be. This reboot version of Charmcaster is a downgrade compared to her in the previous shows. First off is her new reboot design. She looks like just another typical, generic Goth girl that you would see in a generic and typical high school that checks off every generic and typical students and teachers trope that we’ve seen thousands of times before. Her new design looks bland and uninteresting. There is nothing unique about it and it most certainly doesn’t even compete with Charmcaster’s previous character designs. Even her UAF design looks better and more unique than this new reboot design and I’m not even really a fan of Charmcaster’s UAF design. The writers even changed Charmcaster’s origins in the reboot as well. She’s no longer a sorceress from an alternate magic-based dimension and Hex’s niece. She’s just a typical and generic nerdy girl with low self-confidence who just happens to find a magic book and becomes evil. That’s pretty much it. Someone on a forum on TV Tropes argued how this is such a bland and generic origin that has been done thousands of times before and I very much agree on that. This is such a pathetic origin for such a character like Charmcaster. While there were a lot of issues with Charmcaster and Hex in the sequel shows, at least the concept of Ledgerdomain was pretty interesting. It’s nothing compared to how Charmcaster was handled in the Original Series though (uh oh, I’m referencing the Original Series again). Even though the Original Series didn’t show much of what Charmcaster went through, there were plenty of subtle clues that point to Charmcaster’s past, mostly in regards to what she had to go through with Hex. For most, if not all, of Charmcaster’s life, Hex tormented her. He made her fear him. In fact, Hex was the reason why Charmcaster is the very person that we saw her as in the Original Series. That’s such a more unique and interesting take on Charmcaster being evil. There’s so much more depth to it. In the YMMV section of the Ben 10 reboot on Tv Tropes, I read a claim on how the reboot version of Charmcaster could be the most sympathetic to date due to this episode. The most sympathetic to date? Again, this episode’s plot copied off of an Ultimate Alien episode. Charmcaster goes through a similar experience with Michael Morningstar in Couples Retreat. I don’t exactly remember if Morningstar was as extreme in Couples Retreat as he was in The Charm Offensive since that I haven’t seen that UA episode in a while but I say that it’s still a similar enough experience here. However, I would argue that Charmcaster had it even worse in the Original Series because, again, of the torment that she had to go through with Hex. I see Charmcaster as a more tragic character in the Original Series than in the reboot. I have more sympathy towards Charmcaster in the Original Series. I find that the Original Series provided much greater potential with Charmcaster than the reboot did. One final point about Charmcaster in the reboot, she’s now voiced by Tara Strong…because of course she is. Tara does a decent job here but much like how Max Tennyson is just not Max Tennyson without Paul Eiding, Charmcaster is just not Charmcaster without Kari Wahlgren. There was one part in the episode where Charmcaster almost sounded like Tara Strong’s Harley Quinn voice and that just did not fit her. I have a good feeling that that’s going to reoccur often in Charmcaster’s later appearances if Tara Strong continues to voice the character. Overall, this reboot version of Charmcaster is a downgrade to what Charmcaster was before. Is there at least anything that Charmcaster has that resembles, well, Charmcaster? She’s a teen delinquent that has magic powers. Anything else? She has her color pattern. That’s it? Christ, that doesn’t even scratch the surface of her as a character. Is there at least anything that’s good about the episode? The action scenes are, as usual, decent but that doesn’t say much because that’s how most of the action scenes have been throughout the entire show. Either mediocre or decent yet still pertaining the same issues that I’ve mentioned plenty of times before. Michael Morningstar was at least pretty dark and vile in this episode. I’ll give the episode that. Granted though, it’s most certainly not the worse thing he’s ever done. I still remember quite well just how much of a predator Morningstar was when he first debuted back in Alien Force. I mean like this guy was freakin charming and seducing schoolgirls before sucking the life force out of them to the point where they were reduced to zombies. I say Morningstar’s treatment towards Charmcaster in this reboot episode is nothing compared to that. Can’t really say much about Ben and Gwen though because they way that they’re handled in this episode reminds me a lot of how they were handled in the Original Series episode, Lucky Girl. Going back to Morningstar, this time around, he’s voiced by Yuri Lowenthal instead of Drake Bell…because of course he is. I will give him this though. He does seem to fit Morningstar decently well. In fact, he’s more fitting for voicing and portraying Michael Morningstar than Vilgax. There’s not really much else here for me to say. If there were, it would most likely just be more criticism of this episode. Overall, it’s a lazy copy and paste of an episode from Ultimate Alien with Ben and Gwen’s development in this episode pretty much just being a copy from the Original Series episode, Lucky Girl. Charmcaster is another of the many returning characters in this reboot that has been downgraded to a mere shell of what she once was. She is a bland and generic character with a bland and generic design and a bland and generic origin. If you haven’t seen this episode yet, I don’t recommend it. If anyone has any thoughts of their own on this episode, feel free to comment down below. Feel free to follow me on Twitter, Deviant-art, and the Ben 10 Club. Links are down below. Also, feel free to help support the Ben 10 Club by subscribing to their YouTube channel and watching and liking their videos as well as signing up on the official website itself and going to the "Donate" link on the top of their website home page to donate to them through PayPal to help keep the website up and running. The Ben 10 Club also has new merchandise available to purchase on Teespring. If anyone is interested in checking out the new merchandise, feel free to check out this page on the Ben 10 Club website in the link below. "Even her UAF design looks better and more unique than this new reboot design"
Well, I don't think UAF Charmcaster design is unique at all. It was completely different from OS Charmcaster's design and was turned into a carbon copy of Marvel's Enchantress. But I don't like Reboot Charmcaster's design either. My favorite design for Charmcaster is Original Series, then my second favorite is Omniverse (because it looks more like the OS). I don't really like any of the others. I completely agree that removing Hex from Charmcaster's backstory in the reboot was not a good idea, and removed a lot of depth from the character. I really hope they establish some connection between Hex and Charmcaster later in the Reboot. "Is there at least anything that Charmcaster has that resembles, well, Charmcaster?" Fair point, but UAF Charmcaster was also completely different from Original Charmcaster. She was Hope, she was born in Ledgerdomain, her motivation was to ressurect her dead father Spellbinder, none of these aspects fit the character presented in the Original Series at all. I still think that Reboot Charmcaster, as a human teen delinquent girl that has magic powers, is closer to the OS version, and I think there is room for more character development in the future. @csgt I do agree with you on Charmcaster's UAF design. Granted, as shown in the quote that you're using to respond to, that's not the point that I'm addressing here. I'm not stating that Charmcaster's UAF design looks unique overall. I'm stating that it looks better and more unique than Charmcaster's reboot design. Even though her UAF design isn't really unique on its own, is most certainly not a design that I like and favor, and doesn't even hold a candle to Charmcaster's OS design, it is a better and more visually unique design when compared to Charmcaster's reboot design, which, again, looks very much like a typical and generic Goth girl. 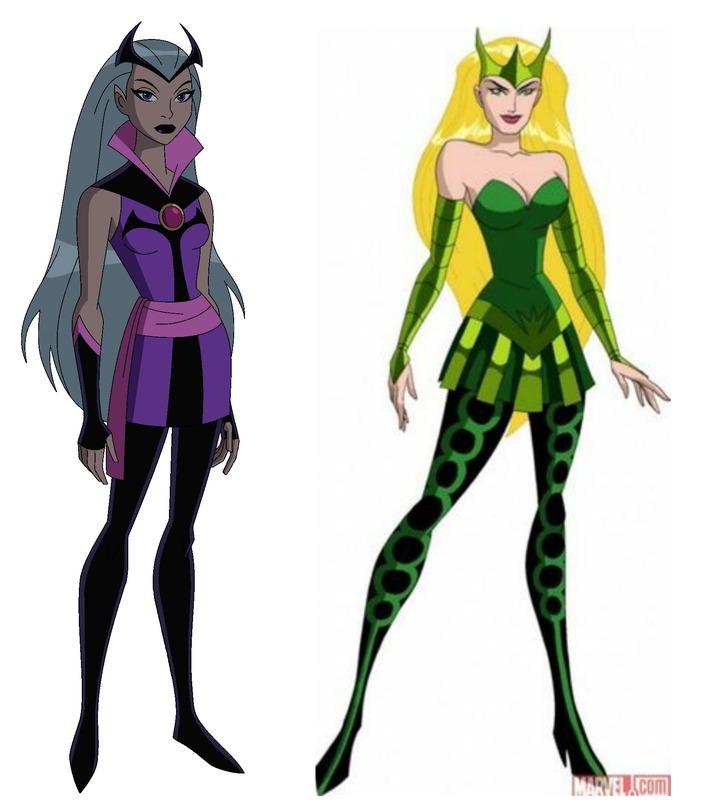 Considering how they've handled the Ben 10 reboot so far, I doubt that they're going to make a connection between Hex and Charmcaster in the reboot. Her first name being Hope and the concept of Ledgerdomain itself are pretty much the only things related to Charmcaster in UAF that I liked. Ledgerdomain does have some nice potential and Hope sounds pretty ironic considering what Charmcaster went through with Hex before the events of the Original Series. Everything else with Charmcaster in UAF is stuff that I don't like. I most especially don't like how they handled her relationship with Hex in UAF though given that it very much conflicts with what was established with them in the OS. Granted, you do make a good point. Charmcaster, and Hex, were terribly handled and written in the sequel shows. However, when it came down to Charmcaster as a character, I really only compared the reboot Charmcaster to the OS Charmcaster because yeah, Charmcaster went through a pretty severe downgrade in the sequel shows and Charmcaster was at her best in the OS. I do have an interest in making an article about Charmcaster and analyzing her as a character, much like how I did with other characters such as Julie Yamamoto and Professor Paradox. I know for sure that this Charmcaster article is going to address the points about her in UAF that you made here.